as money from various projects trickles in, i am constantly tweaking and adding to my home tech setup. the latest setup allows me to view my DVD collection over wifi in my home, over remote wifi, or even 3G when away. this article is rather lengthy, but i hope to provide a complete picture of the setup for your education. also, if anyone has any suggestions for streamlining or adding to the existing setup, please post in the comments below. one last note, this article is part one, and it completely covers my entire remote DVD viewing setup with limited details. part two will cover using a similar setup for sharing dailies for film crews. while not everyone will be interested in part two, part one is a prerequisite for understanding part two, as the latter will not cover the details of the technical setup. i abandoned traditional television service some time ago, cost being the biggest factor at the time. i can honestly say i haven’t really missed it. i have two 4:3 tube televisions that are never used. ditto for two DVD players and this… what is this? V H something… can’t quite make it out for all the dust. as a kid, i learned how to edit with two consumer VCRs. Final Cut Pro gives me a few more options nowadays. likewise, advances in technology have improved my film and television viewing experience as well. first, i just want to put on record that the best place to watch a great film is in a great theater with other people. while the combination of great film and great theater might be a rare combination these days, there is likely a great cinema somewhere near you that offers a great film watching experience — darkened room, bright projection, robust sound, and hopefully a respectful, enthusiastic audience. as i referenced in a previous post, streaming and digital download is the already-present future of digital media. music is already heading over the curve toward streaming. movie and tv services like Netflix and hulu are growing in use, but people still want to own movies. DVDs are still around, and Blu-Ray is enjoying some modest success. being in my early thirties, i have already accumulated a pretty sizable movie collection. buying brand new digital download copies isn’t really an option on my budget, but i often shop online first for new purchases, beginning with the iTunes Store. i cant wait for the day when digital download becomes affordable for me. the inclusion of metadata with digital downloads makes for easy sorting, searching, etc. i constantly run out of hard drive space — a problem not unfamiliar to filmmakers working in the digital realm. recently, in an effort to solve two issues, i bought a LaCie 2TB NAS. Network Attached Storage allowed me to not only increase my hard drive capacity at the house, but also allowed me to give others remote access to up to 2TB worth of data. one issue resolved was the sharing of files like dailies and cuts of films in progress. these files are often too big to share via a free Dropbox account (limit 2 GB). resolving the second, personal issue, the NAS became a great way for me to access my personal media — inside the house over wifi, or remotely. it has become the hub of my wicked-awesome, remote-access media setup. the first thing i did with the new home server was to move my iTunes music folder to it. the shares on the NAS mount similar to an external drive, so the path becomes volumes/share/etc., even when connected remotely via afp. while there are cheaper/free solutions available, i pay extra each month for the convenience of a static IP through Bellsouth. 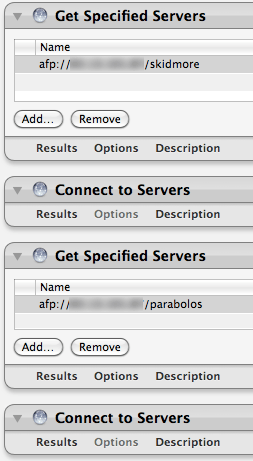 i also created an Automator app that quickly connects and mounts the NAS volumes via afp IP. adding this Automator app to my login items means that my NAS (and therefore my iTunes library drive) connects on boot-up, even if I’m away from home. a Dropbox hack (outlined by my buddy Stephen here for syncing Safari history) on my laptop and my new iMac allow me to add to iTunes from either machine. this maintains one complete library – system prefs and library files synced with Dropbox, media accessible through the NAS. disclaimer: for the purposes of this article, i am referring, of course, to DVDs that perhaps you have created or to which you proper rights or permissions. i am in no way suggesting you pirate commercial DVDs. the information provided here is for your education on the technical setup. please don’t pirate because i am a filmmaker, and i need to eat. the next step was to start ripping my DVDs to the NAS. many people use an app like Handbrake to rip a DVD into a format that is both compact and playable via iTunes or an iOS device. that’s fine, but i haven’t had tremendous success with Handbrake. limited settings and audio drift issues have kept my use of it down to almost never. instead, i use Mac the Ripper, and rip the entire disc, as is. by ripping the entire disc, i can access the VIDEO_TS folder with OSX’s DVD player application and access all the features of the original disc — commentaries, special features, subtitles, etc. with these rips on the NAS, i can access them with my laptop anywhere in the house wirelessly. technically, i can access them remotely via afp, since the NAS is setup to allow it. the problem here is my home upload speed. on a good day, i might get around 200kbps upload speeds — fine for streaming my iTunes library to my laptop at Starbucks, but nowhere near fast enough to play uncompressed DVDs. so until recently, watching my DVD collection, while wireless, was relegated to the house. introduce Air Video to the mix. Air Video (iTunes link) is an app for iOS (both iPhone/iPod Touch and iPad, free trial version available) that allows you to stream content from your media library to your iOS device. a free desktop server app allows you to add any media folder you like. these folders are then accessible via your devices. naturally, a lot of media you may have on your desktop might not be iOS compatible. Air Video offers two options. the first is to convert it all and create iOS compatible copies of it. no thanks. my desire to avoid redundancy is one reason i don’t use Handbrake AND Mac the Ripper in the first place. the second option is called Live Conversion. if your desktop system is powerful enough, Air Video can convert any video on the fly and then send an iOS-compatible stream to your device. Air Video even has a feature to quickly and securely access your desktop libraries remotely. this means you can access Live-Converted video over a remote wifi connection or even 3G. and Air Video is smart; it knows what type of connection you are on. in the global settings of your iOS device, you can set the bitrate for Live Conversion. i’ve adjusted my remote wifi and 3G settings down to 128kbps to comply with my snail-paced home upload speeds. in the house, though, i get great quality video on my iPad or iPhone 4.
watching a movie is now as simple as booting up Air Video on my iPad and selecting from the list of everything on the NAS. the best part is that i can do this anywhere i have an internet connection. it’s not a perfect setup. Live Conversion works on files, not folders. Air Video does not yet include support for an entire VIDEO_TS folder. thus, you navigate to the specific .vob file you wish to play. each feature on a DVD is separated into separate .vob collections, with each .vob file having a 1GB limit, or approximately a half-hour or so. this means a typical feature film will be multiple .vob files. Air Video gives you the option to automatically proceed to the next file in the list, but there’s a few second delay in playback as it backs out of the first stream and proceeds to the second. 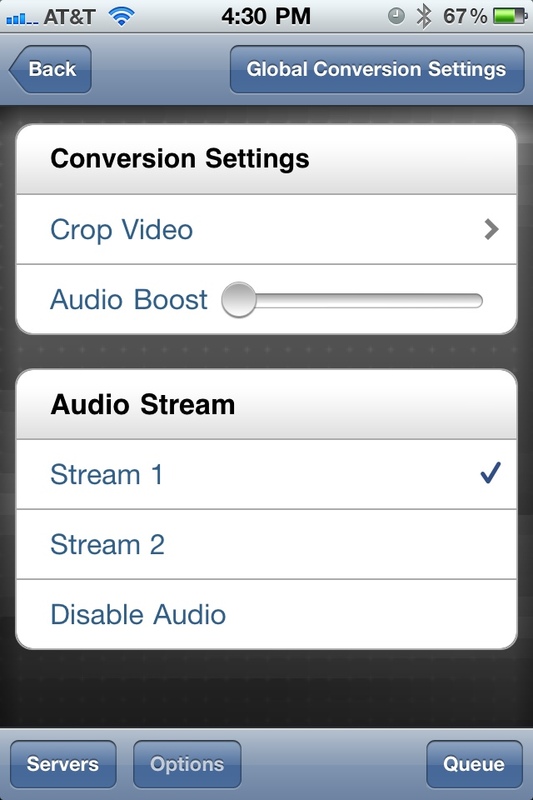 while there is support to crop the video, boost the audio, and choose an audio stream, it doesn’t support subtitles or indicate which audio stream is which. also, to access global settings, you have go into the settings for an individual video, where you have the option to modify settings globally— not exactly intuitive. other global settings are available via the options button at the bottom of the interface. personally, i think this could use some cleaning up in what is an otherwise elegant design. perhaps the biggest issue is that once you’ve started a stream, scrubbing isn’t really an option with Live Conversion. i’ve found that once you’ve begun a .vob, the only option is to completely restart it if you want to go back — particularly frustrating if you happen to doze off for a minute. this issue is also frustrating when a DVD that is a collection of videos is divided up via a script, rather than broken into separate files — a problem i encounter often with collection-type DVDs. while the Live Conversion settings seem to give you the option of starting at any point in the .vob file, i haven’t ever had success with it. i believe this is more a limitation of trying to convert an MPEG-2 file into a data stream, rather than a shortcoming of the app or service itself. if the Air Video developers could overcome these apparent limitations of MPEG-2-to-streaming conversion and have seamless playthrough of playlist files, that would make it possible to better replicate a DVD-viewing experience. allowing Air Video to see a folder enclosing a video_ts folder as a piece of media would be even better. for example, clicking on the folder “movie” could give you a choice of the enclosed feature items or take you directly to the Live Conversion panel if there’s only one movie. this would be an improvement upon clicking on “movie > video_ts > vts_02_01.vob” and hoping you’ve got the right file. which kind of touches on another small issue. while Air Video is smart regarding your connection, it’s dumb to your data. other media library services (like Plex) access the web to connect your media with metadata content (automatically discerning the name of the film, DVD case art, director, actors, etc.). at the time of this posting, the Plex iOS app does not live convert .vob files, however, thus making it incompatible with the way i’ve stored my DVD collection on the NAS. still, even with limited issues, it’s not a bad setup. i can watch my DVD media from anywhere i have an internet connection. and since Air Video supports the new Airplay service, i can bounce the audio from my iPad to my stereo speakers or toss the video to an Apple TV at a friend’s house. my next big paycheck will likely go toward an Apple TV and accompanying HDTV for my own home for just this purpose. no doubt Apple will give its users the ability to do something similar before too long, but it still seems to be a year or two out. i have high hopes for that NC data center, though. Airplay, Apple TV 2, Apple’s friendly relationship with Netflix, and that mountain of cash-on-hand also point to some great media sharing developments for the future. until that time, I’m ok with spending $4.99 on an app that lets me do it myself. Great article. I have a gopro hero 2 and just got the wifi bacpac attachment for Xmas. I am a skier and was hoping to watch the morning clips at lunchtime to see what needs to improve on my ipad3.